Scarlet awoke in the woods without her memories. She lived in mystery until she met a boy with a familiar voice. A boy with secrets. A boy with answers. A boy named Gabriel Archer. Intrigued by his voice, Scarlet immerses herself in Gabriel's life only to discover he has a brother he's kept hidden from her: Tristan Archer. Upon meeting Tristan, Scarlet's world becomes even more muddled. While she's instinctively drawn to Gabriel, she's impossibly drawn to Tristan—and confused out of her mind. Why does Gabriel seem so familiar? Why is she so attracted to Tristan? And why do both brothers keep telling her she's cursed to die? 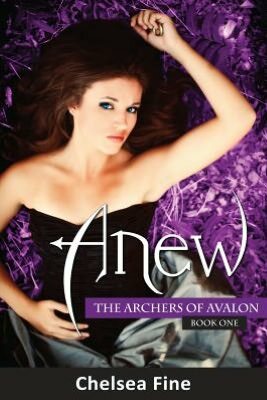 Scarlet doesn't have the answers...but the Archer brothers do. "Best Young Adult Book 2011," "Original Young Adult Paranormal, " "Best Young Adult Cover of 2011"
"Book of the Year Finalist (ForeWord Magazine)"
"Best Coverof 2011 (Girls on YA Books)"
"Best Cover of the Year (UtopYA Con Awards)"
Well, what a thoroughly awesome book to read on a Friday night! I loved this paranormal YA gem about two gorgeous immortal brothers and the love of their lives who keeps dying and being reincarnated with the same "heart" issues. Chelsea Fine has a brilliant idea for a book series, and she executes it beautifully. I had a very entertaining time reading this novel. Driven by gorgeous and interesting characters in a fast-moving plot, this book will keep you hopping over the several hours it will take to discover the mystery of why Scarlet has amnesia and who the hunk, Gabriel, and his brother truly are. The chapters run short and succinct making the action whiz by! Ms Fine is the consummate author for young adult readers. She has a wonderful imagination and the power of a wordsmith to back it up. This is a series I'm going to love reading. I thought the ending of "Anew" was powerful! Sometimes love is meant to be. But sometimes love...is the death of you. Seventeen-year-old Scarlet has just died. Only, dying isn't unusual for a girl under a centuries old curse that left her semi-immortal. This time, though, she comes back to her current life instead of awakening in a new one, and she realizes the curse is changing. With the help of the immortal Archer brothers, Scarlet must piece together her life and try to break the curse before her impending death comes again. This is a book and a series you'll enjoy reading! Great escape novel. and add your email address! Then follow me on Networked followers, please. Note: This giveaway is open to US and Canada only. This looks like a fantastic book! Thanks for the opportunity to win. My e-mail address is alexandchrissy(at)yahoo(dot)com. My first love was an irishman. Irrestible! LOL! Who can resist a mysterious boy? I remember way back before paranormal was so popular in YA, that I was first introudced to paranormal from YA books. I miss that!